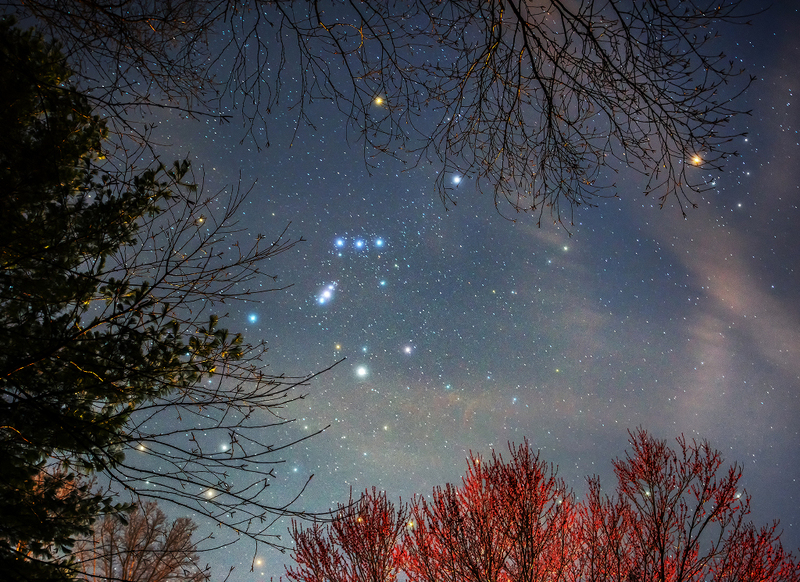 Explanation: As spring comes to planet Earth's northern hemisphere, familiar winter constellation Orion sets in early evening skies and budding trees frame the Hunter's stars. The yellowish hue of cool red supergiant Alpha Orionis, the great star Betelgeuse, mingles with the branches at the top of this colourful skyscape. Orion's alpha star is joined on the far right by Alpha Tauri. Also known as Aldebaran and also a giant star cooler than the Sun, it shines with a yellow light at the head of Taurus, the Bull. Contrasting blue supergiant Rigel, Beta Orionis, is Orion's other dominant star though, and marks the Hunter's foot below centre. Of course, the sword of Orion hangs from the Hunter's three blue belt stars near picture centre, but the middle star in the sword is not a star at all. A slightly fuzzy pinkish glow hints at its true nature, a nearby stellar nursery visible to the unaided eye known as the Orion Nebula.